Use these five tips to improve your mobile phone photography skills and enter the Digital Camera Photographer of the Year competition for free! With advancement of smartphone technology booming, photography has shifted from a specialist hobby and profession, to something that everyone is having a go at. Whilst shooting using your phone can be limited in some respects, in others it can be a real advantage and get you great results. So how do you get the best results from your mobile phone and stand out from the crowd? Whether you're shooting with a regular single-lens smartphone or one of the latest multi-lens phones like the Nokia PureView 9, the same basic rules of mobile photography apply. 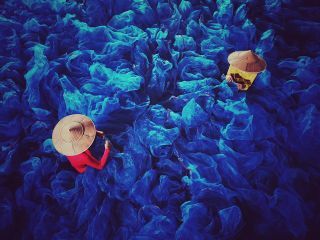 Here are five amazing pictures from the Smartphone category of Digital Camera magazine's 2019 Young Photographer of the Year and Photographer of the Year competitions so far. Make sure you enter your shots now to be in with a chance of winning a share of £30,000 of amazing prizes! It's tricky to blend into the background when you're holding a big D-SLR and lens, however with your smartphone you're not going to look out of place wherever you are. If you're into street and documentary photography then you can capture some great shots of people passing by using your phone. Did you know there's a range of accessories (and no - not just selfie sticks) you can now use with your smartphone to help you get better results? For example if you're into macro photography then invest in a mobile macro lens, or for landscape lovers then look into a smartphone wide angle lens. LED light panels can come in handy for portrait shoots. There are many different options. Working with light is the key to bringing your image to life. Consider its direction and strength, and what it brings to the story. Whether the warm glow of golden light, a cold blue morning, or harsh midday shadows, each affects the mood of your story in different ways, so utilize them to tell it. With the creation of smartphone apps there are many different editing effects and filters you can add instantly to your image. There are many great apps out there to help improve your photos. We favour the free Snapseed app (iOS and Android) for quick edits, and Affinity Photo on the iPad Pro for the more detailed work. Both Snapseed and Affinity Photo have a facility to develop RAW files, where you can adjust Exposure and White Balance among other things. If you want your images to reach a large audience in an instant then there are many photo sharing apps and sites out there that you can do this through. Instagram is one of the biggest and most popular, however you should also check out Flickr, DeviantArt, and 500px to get started.